ab52454 recognises several isoforms of HLA-G expressed in all populations of extravillous trophoblast (cell columns, interstitial trophoblast, endovascular trophoblast, placental bed giant cells). It does not cross-react with any other MHC Class I antigens (HLA-A, -B, -C, -E, -F). Murine L cells transfected with both human beta2-microglobulin and HLA-G.
Purified from hybridoma culture supernatant by protein-A affinity chromatography. Our Abpromise guarantee covers the use of ab52454 in the following tested applications. ICC/IF Use a concentration of 10 µg/ml. Flow Cyt Use a concentration of 5 - 10 µg/ml. ab170191 - Mouse monoclonal IgG2a, is suitable for use as an isotype control with this antibody. Involved in the presentation of foreign antigens to the immune system. Plays a role in maternal tolerance of the fetus by mediating protection from the deleterious effects of natural killer cells, cytotoxic T lymphocytes, macrophages and mononuclear cells. Belongs to the MHC class I family. Contains 1 Ig-like C1-type (immunoglobulin-like) domain. 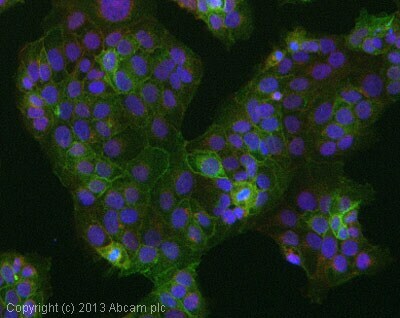 ICC/IF image of ab52454 stained Jeg3 cells. The cells were 4% paraformaldehyde fixed (10 min) and then incubated in 1%BSA / 10% normal goat serum / 0.3M glycine in 0.1% PBS-Tween for 1h to permeabilise the cells and block non-specific protein-protein interactions. The cells were then incubated with the antibody (ab52454, 10µg/ml) overnight at +4°C. The secondary antibody (green) was ab96879, DyLight® 488 goat anti-mouse IgG (H+L) used at a 1/250 dilution for 1h. Alexa Fluor® 594 WGA was used to label plasma membranes (red) at a 1/200 dilution for 1h. DAPI was used to stain the cell nuclei (blue) at a concentration of 1.43µM. Publishing research using ab52454? Please let us know so that we can cite the reference in this datasheet. There are currently no Customer reviews or Questions for ab52454.